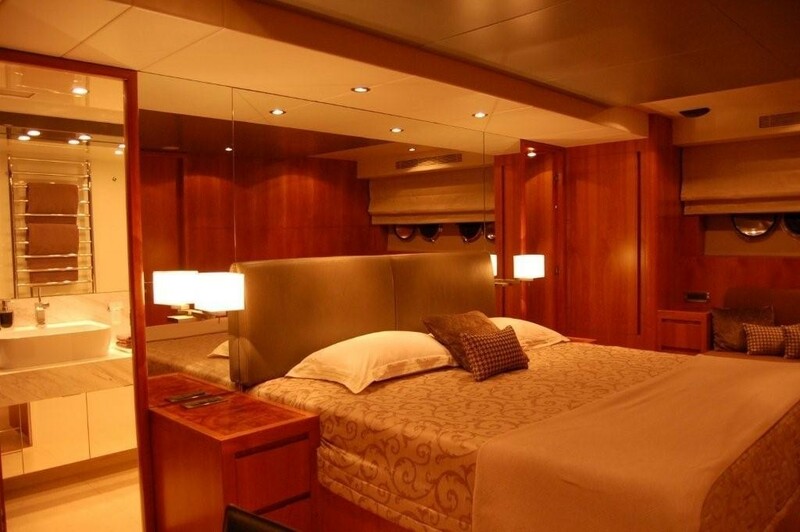 Motor yacht AQUARIUS is a 2009 Horizon 97ft (30m) 97 R P H (Raised Pilot House) luxury motor yacht based in Fiji. 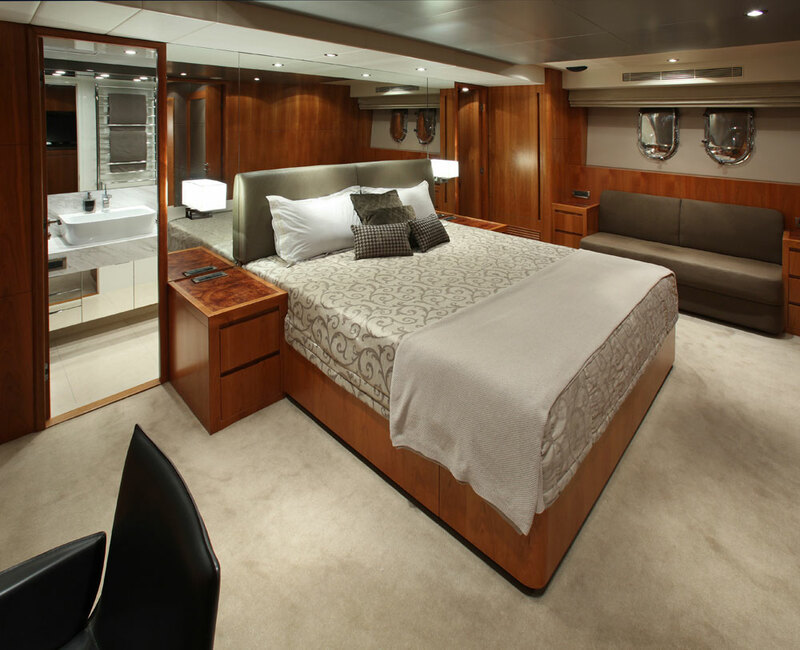 M/Y AQUARIUS is modern and fresh, sporting sleek lines and spacious light interiors, with teak throughout. 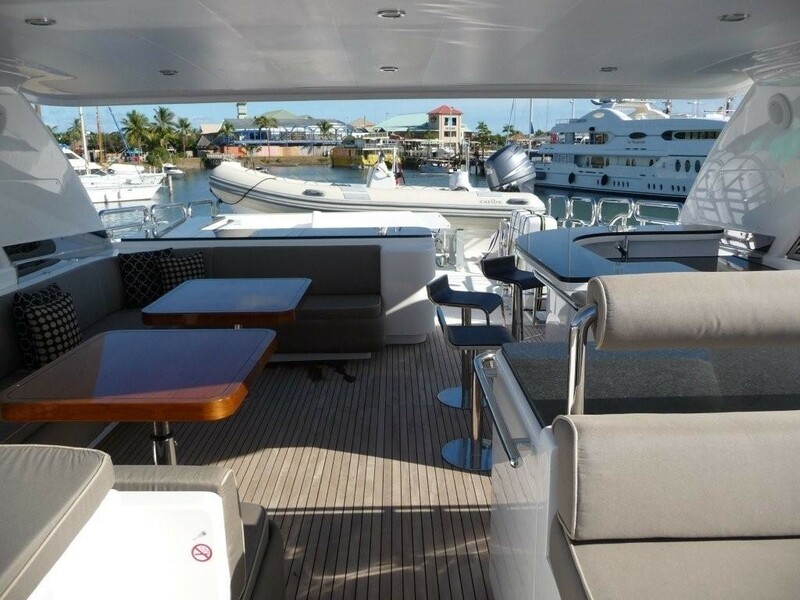 The AQUARIUS motor yacht is the perfect platform for hosting holidays with friends, colleagues and families alike, and what better place to entertain, than the beautiful Fiji Islands. 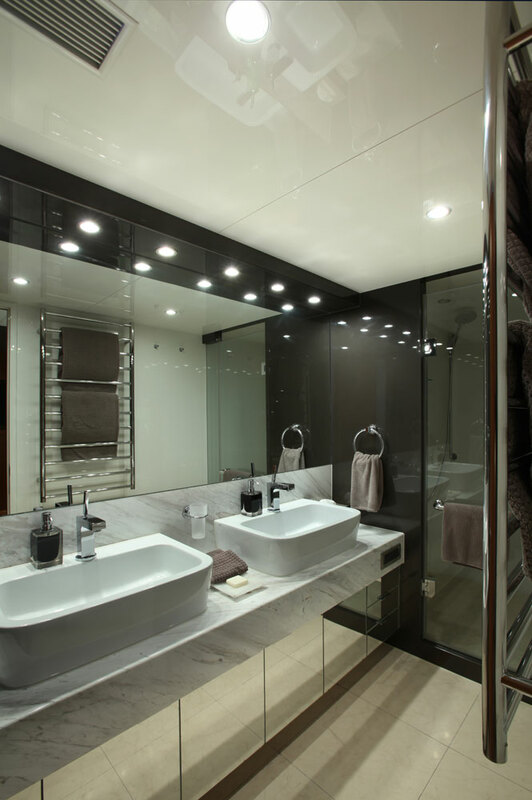 M/Y AQUARIUS sleeps up to 10 guests (8 adults and 2 children) and features an intelligent design and layout with plenty of space for a yacht of this size, both inside and out. She is big enough to host large parties but small enough for the experience to be personal and exclusive. AQUARIUS is a modern Horizon luxury motor yacht boasting contemporary European styling and performance as well as lovely woodwork and craftsmanship throughout. 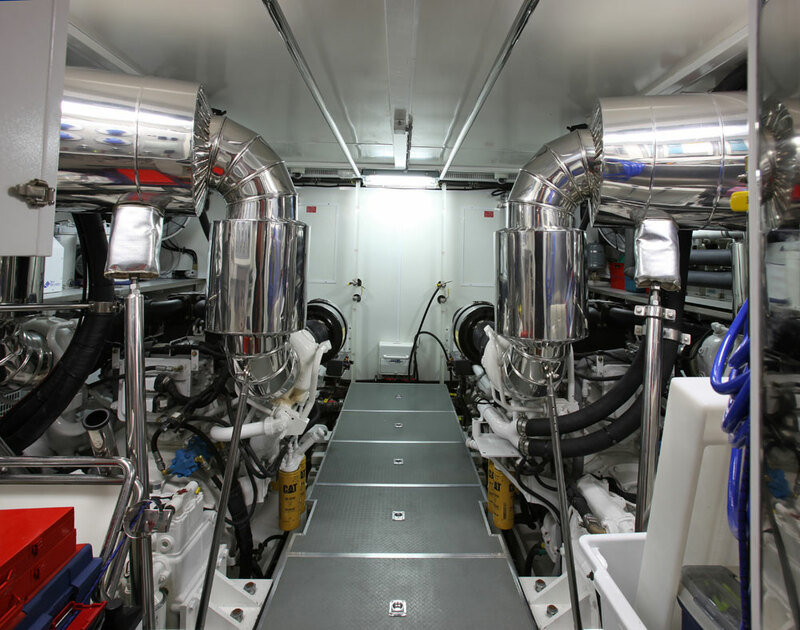 The Horizon 97 AQUARIUS is a wide body version of the 97 RPH with four large cabins on the lower deck with en suite heads, a huge country kitchen and galley, and a beautiful formal dining area. 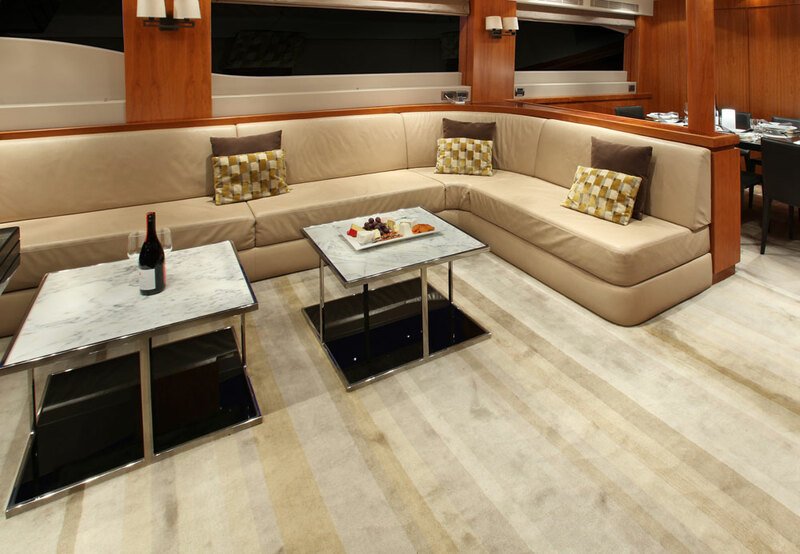 The salon features two comfortable sofas and opens out to the aft deck which offers alfresco dining. 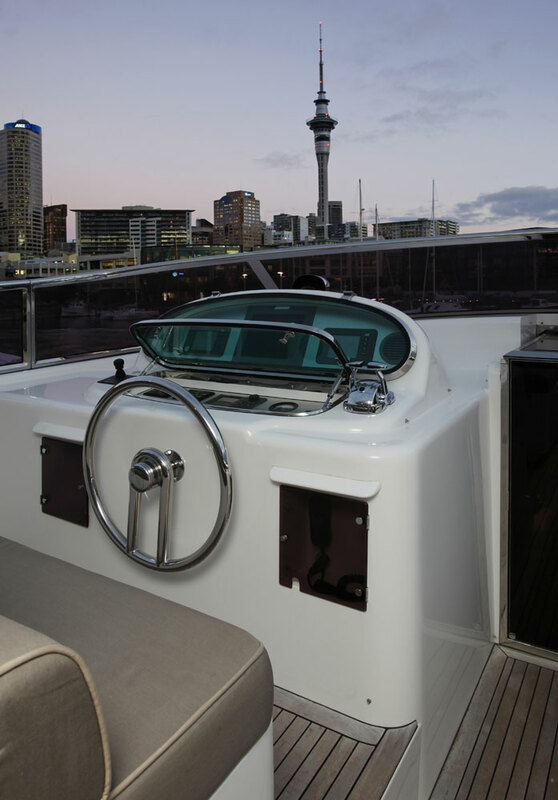 She boasts the latest Bose sound entertainment systems, TVs, CDs, a Spa Pool pool, a 4.5m Tender with 60hp outboard. 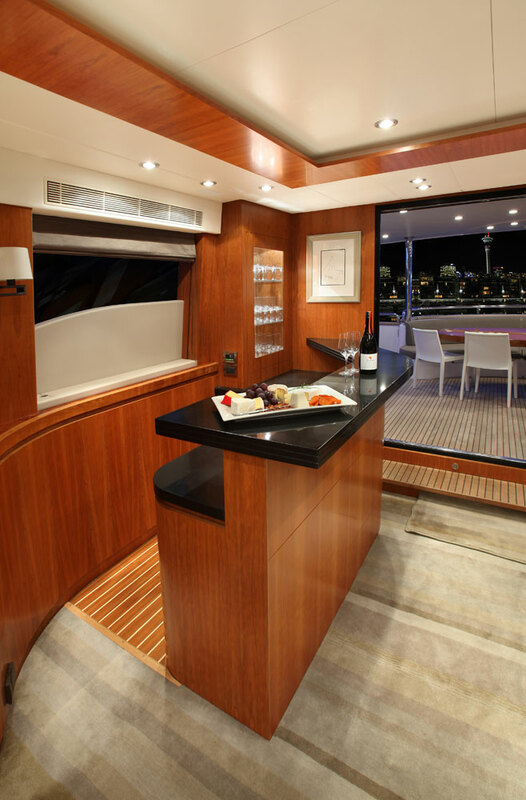 The AQUARIUS yacht has a wonderful flybridge (sundeck). 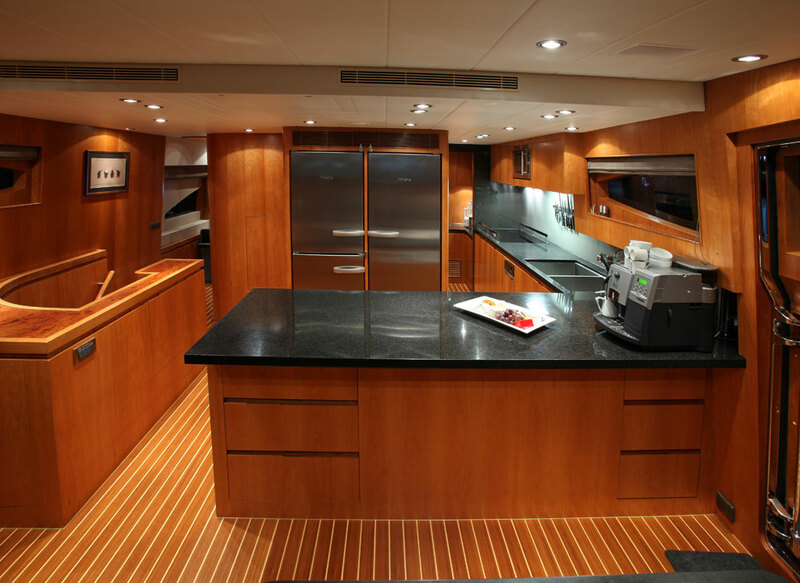 On the starboard side of the sundeck is a sun pad area with additional forward bench seating. 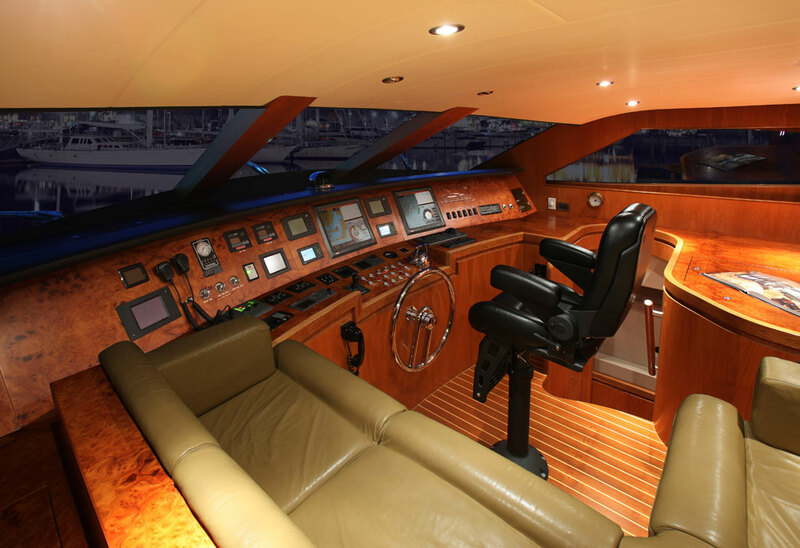 The Helm station seats four or five people. 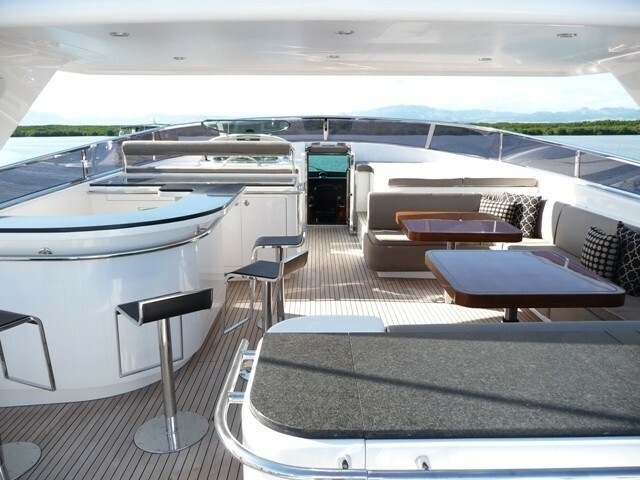 There is a hardtop cover for extra shading and a horseshoe shaped booth with dining table seating 10 to 12 charter guests, with a bar area directly opposite. 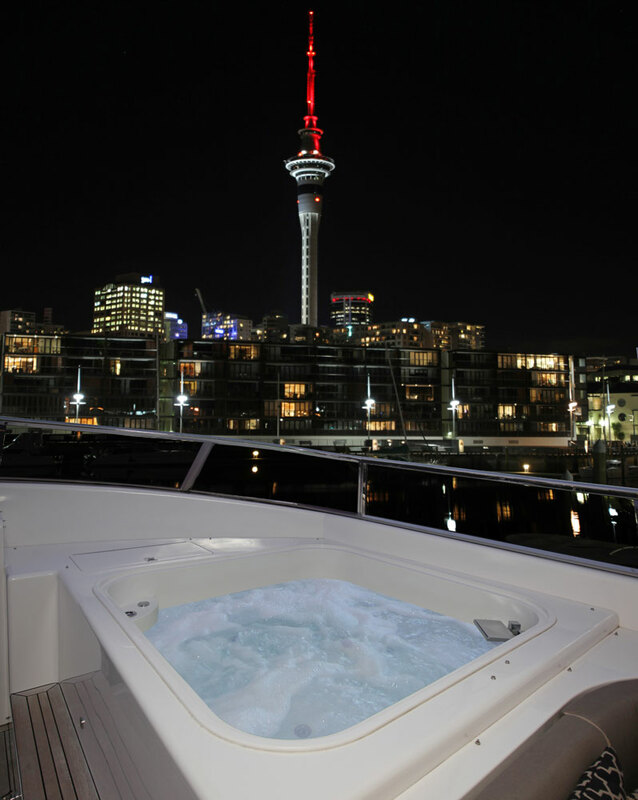 The large and comfortable Spa Pool pool is on the starboard side of the yacht and just aft of the table. 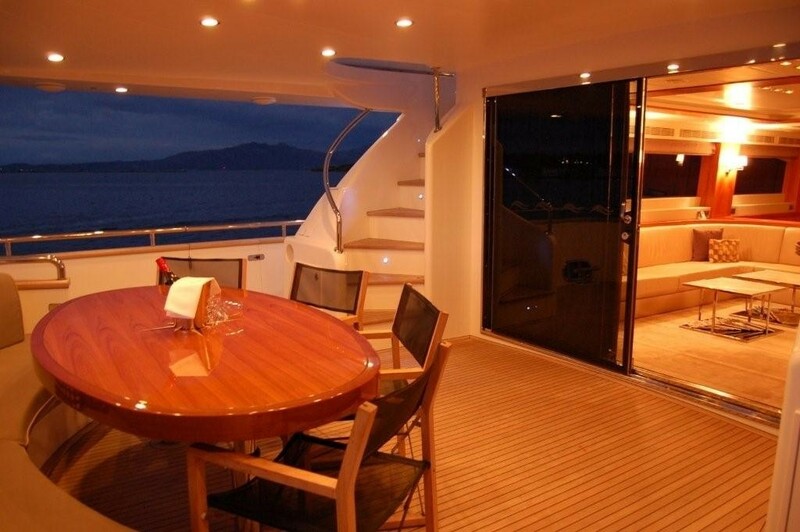 The sundeck staircase leads directly down by teak steps to the aft deck area. 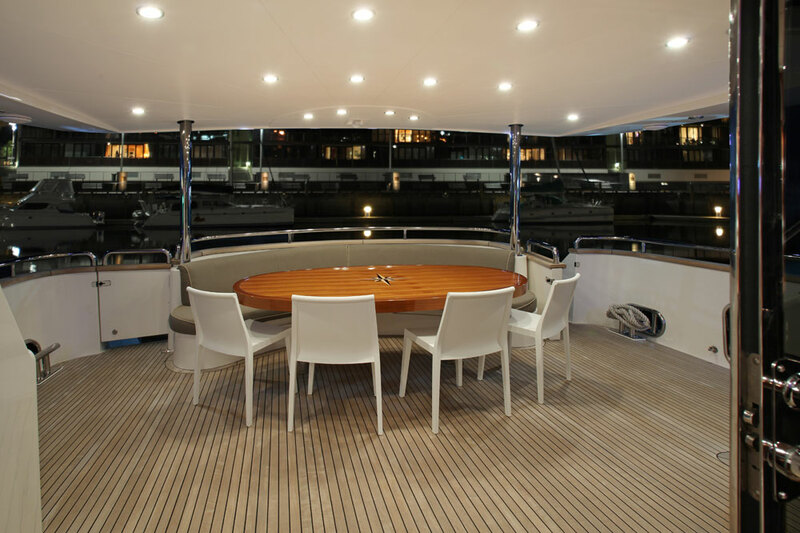 The Aft Deck of the AQUARIUS motor yacht has a curved seating area with a large wooden dining table finished in high gloss cherry wood. 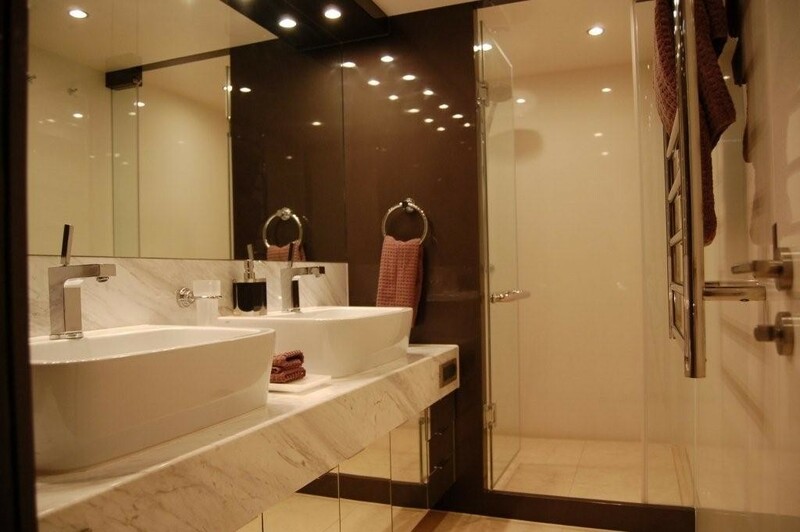 She has a European style transom and her swimming platform is large and user friendly with fresh and seawater wash down. 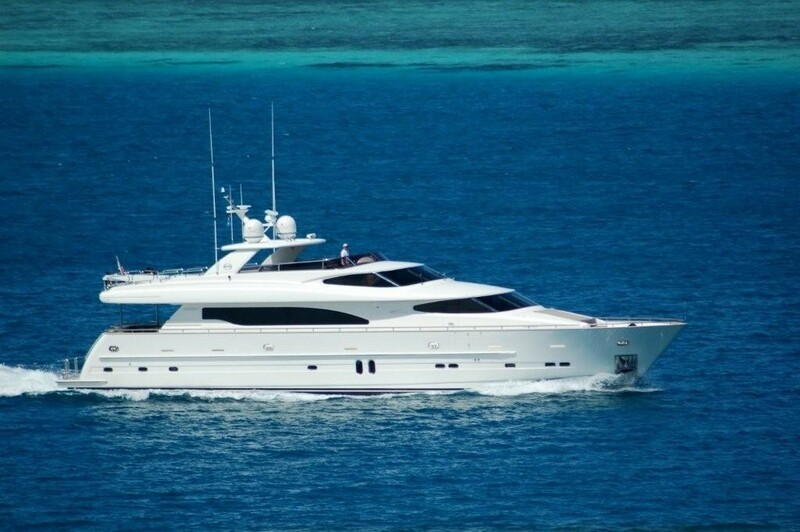 The Horizon motor yacht AQUARIUS is available to charter in Fiji and the South Pacific. 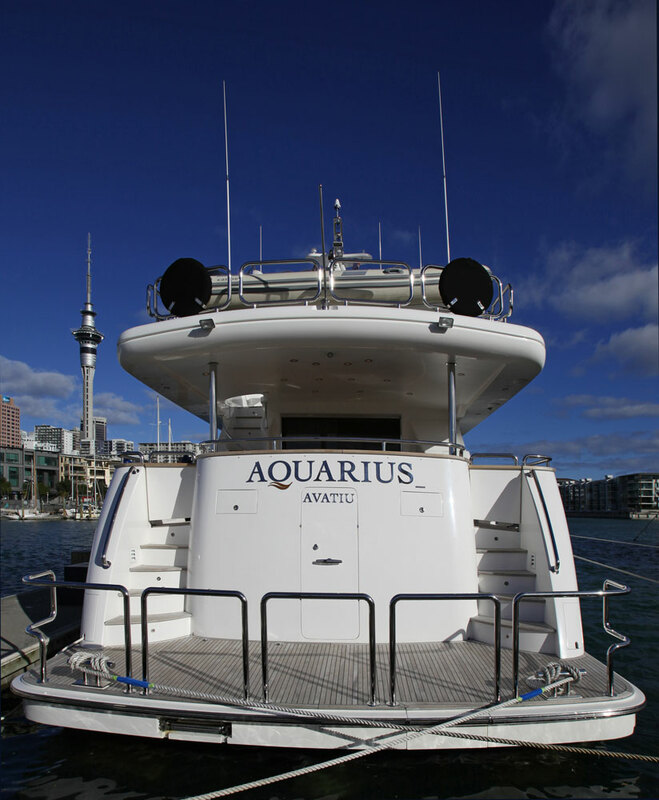 Aquarius boasts a plethora of luxuries, water toys and facilities. 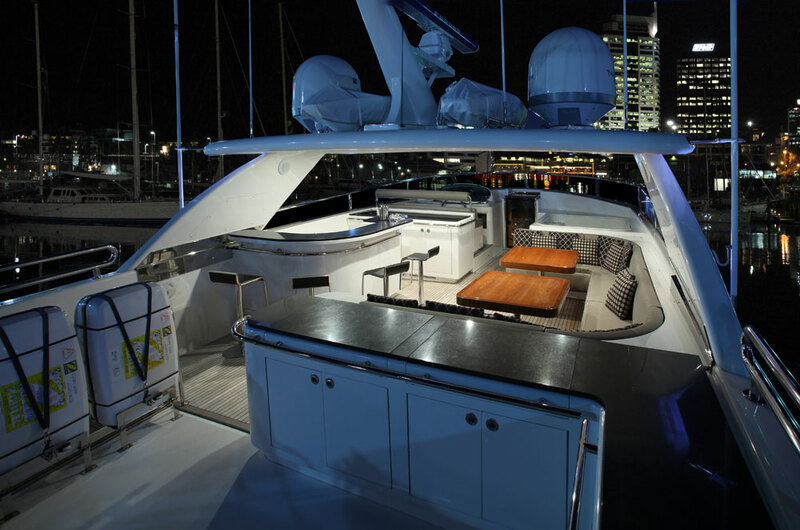 Her excellent array of water toys will keep the kids (or the kids at heart) busy for as long as they've got the energy and the BOSE entertainment system with a large hard drive of movies will keep the critters busy when the sun goes down. 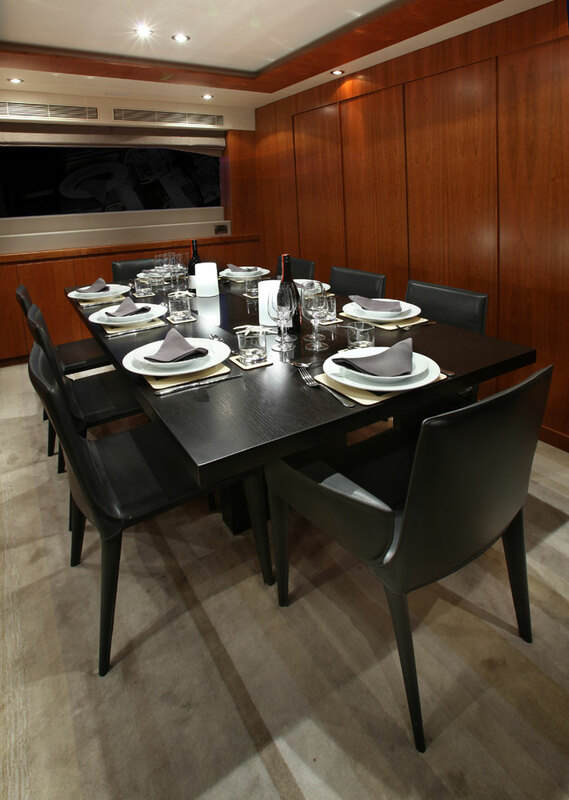 Motor yacht AQUARIUS is able to accommodate up to 10 guests (8 adults and 2 children) in 4 cabins. 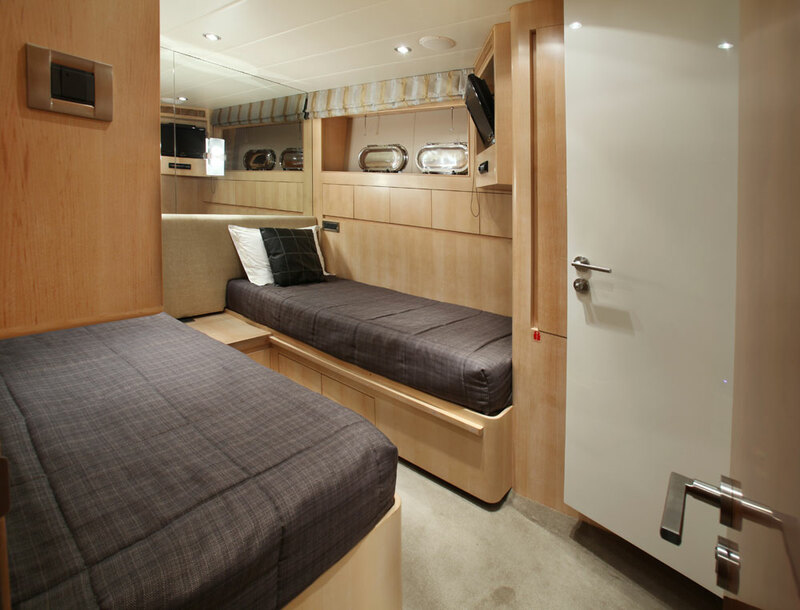 Her full beam master cabin, located on the lower deck is fully appointed with large ensuite and his and hers vanities, a walk in wardrobe and plenty of space. 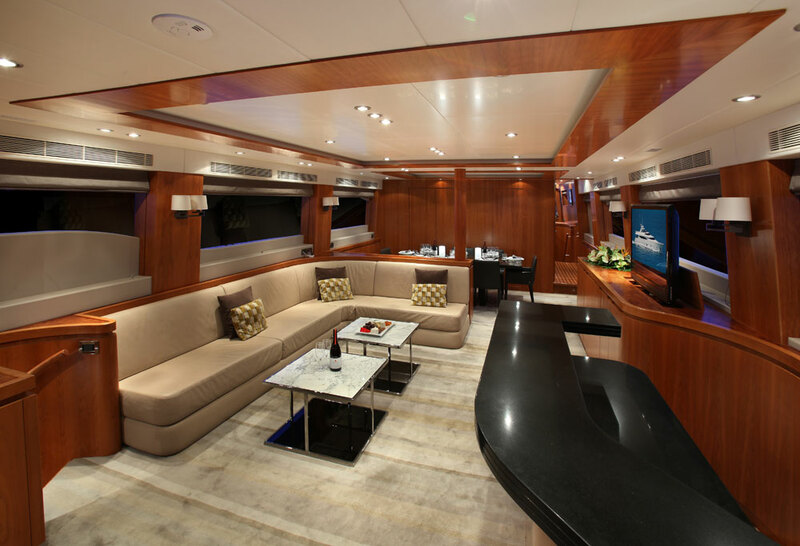 The spacious VIP cabin is located forward at the end of the passageway on the lower deck featuring a large en-suite. 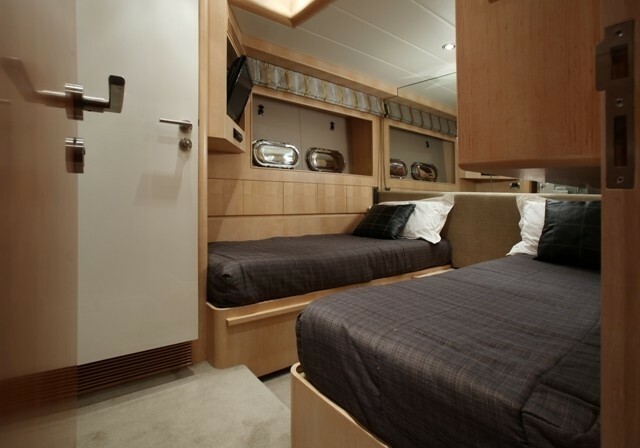 There are 2 convertible twin cabins, each with private ensuite. 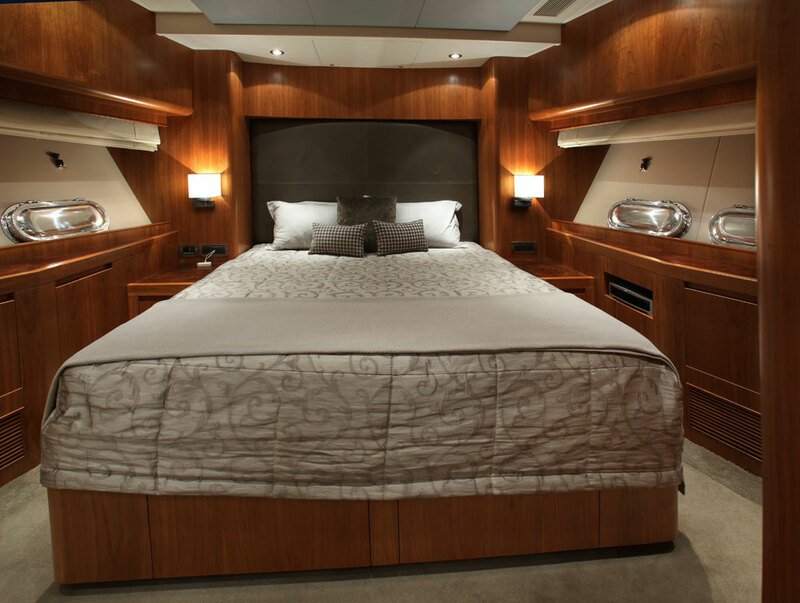 The twin beds convert in to a Californian king so the yacht suits a party of four couple or a couple of families. 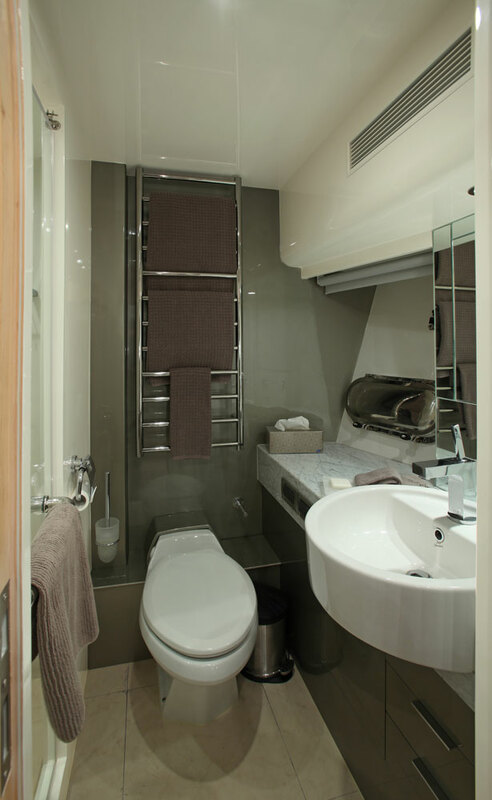 The twin cabins also have Pullman berths that can fold down to accommodate any children in the group. 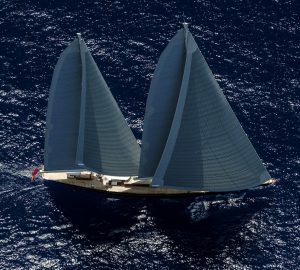 The Horizon yacht AQUARIUS has the following Tenders and toys onboard for guests to enjoy: a4.5m caribe with 2010 60hp Yamaha 4 stroke, 2 Kayaks, Waterskis, Wakeboards, Fishing gear, 2 sea bobs. SCUBA: Rendezvous diving organised from the yacht. 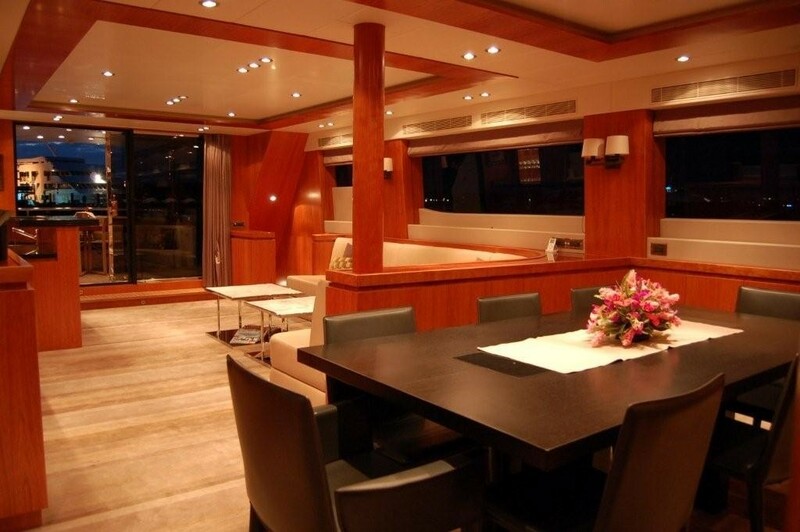 Guest Features: Hardtop with extended aft flybridge deck, Full teak decks, lower and upper, Hydraulic Swim platform, Underwater lights, CCTV Cameras, Sunbrella canvas on all exterior seating and covers, Spa Pool on top deck, Hydraulic davit, Quality European fittings throughout, 200 gallon holding tank.